As part of the Fleet Pond Restoration Project a fish exclusion zone was proposed on the western edge of the pond to the north of the Chestnut Grove landing stage. A permeable curtain is used which allows free flow of water but does not allow fish to enter the zone. The zooplankton (tiny creatures like daphnia for example) will feed on algae which live suspended in the water, allowing the clarity of the water to improve. Once sunlight can reach the bottom of the lake seeds in the base mud will hopefully germinate and grow into submerged aquatic plants which will increase the oxygen levels in the water and provide food and sanctuary for other aquatic invertebrates. It is hoped that these will provide a reservoir of vulnerable species which can be used to restock the main pond once the dredging and other works are completed. The curtaining off of the exclusion zone was completed recently ready for the fish to be removed. A decision had already been taken that the best way to remove the fish would be to use electro-fishing. An experienced crew in a boat dangle anodes in the water and uses a current of between 1 and 5 amps at 150 volts (depending on the conductivity of the water) to attract and temporarily stun the fish which are then carefully removed by another member of the team using a net to transfer them to tanks filled with oxygenated water from the lake. At the end of the exercise these are then relocated into the main body of the pond. 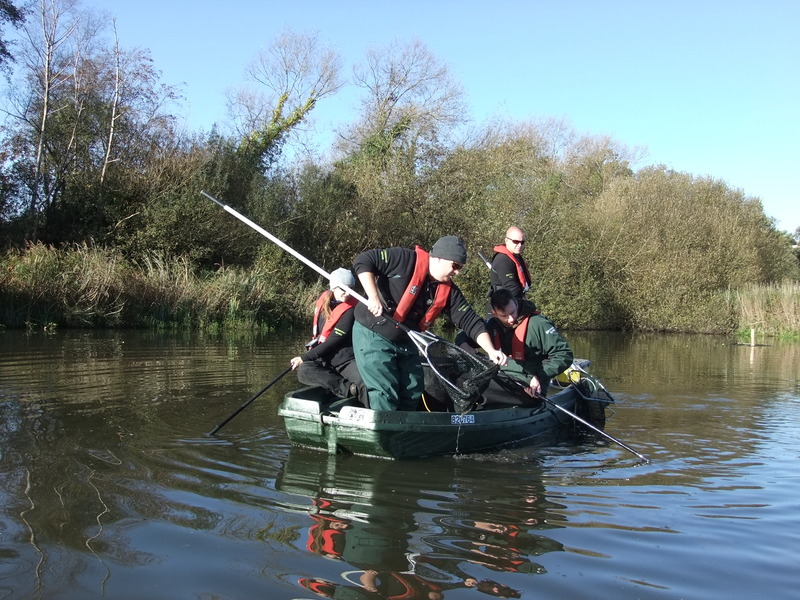 On a bright and crisp morning in early November the team from the Environment Agency arrived at Chestnut Grove to electro-fish the exclusion zone. Dr. Karen Twine (known in angling circles as the “Barbel Lady” for her research into barbel populations in the River Great Ouse) assisted by Dave Hellard, Andrew Wetherby and Michael Collins loaded up their boat with the necessary equipment and moved into the exclusion zone where they electro-fished for more than two hours, watched from another boat by Terry Austin and myself of FPS. 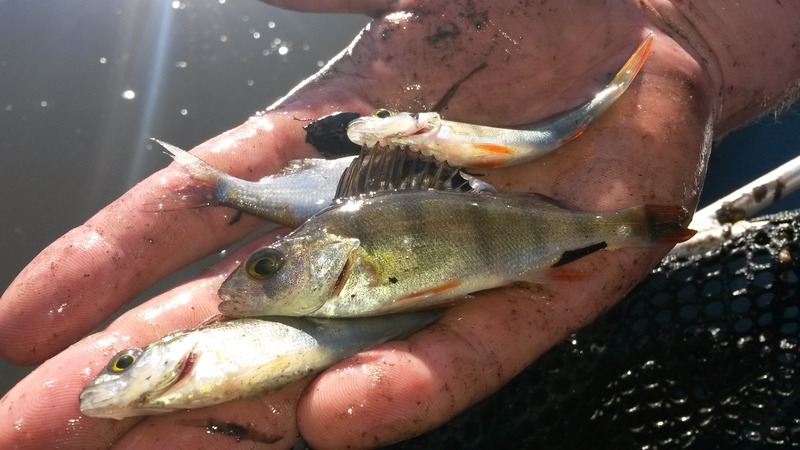 The catch was not enormous in quantity but included pike, perch, roach and bream. Given that the exclusion zone will need to be electro-fished regularly (every year or every other year) this is a long-term project. (At Barton Broad in Norfolk it took about two years to achieve a higher clarity of water.) If the exclusion zone is successful another zone may be created close to Sandy Bay. For further background watch the video on YouTube as displayed above. Ed. 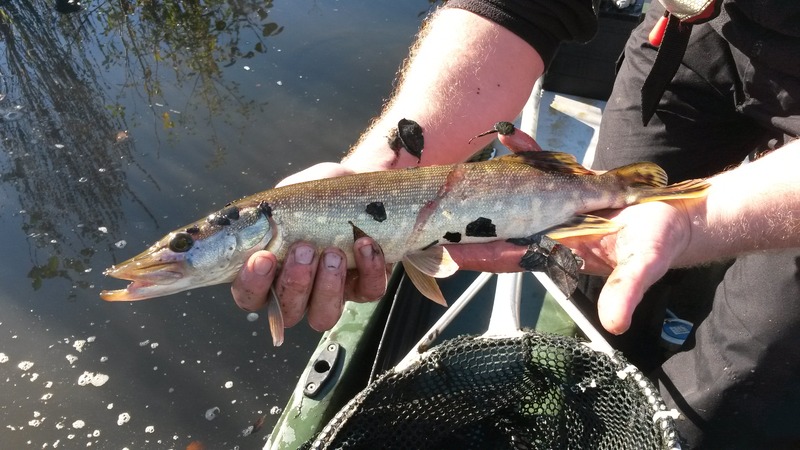 A version of this article first appeared in the FPS Autumn 2014 Newsletter under the title: ‘Fish Exclusion Zone and Electro-Fishing at Fleet Pond’. The newsletter is available to members of FPS (joining instructions here). This entry was posted on Sunday, November 30th, 2014 at 12:22 pm and is filed under Events, People, Plants and Animals. You can follow any responses to this entry through the RSS 2.0 feed. You can leave a response, or trackback from your own site.